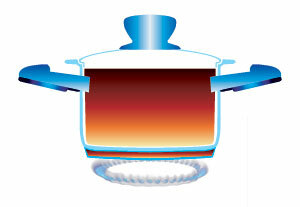 Stack heating / combination cooking provides a cleaner, cooler, more energy efficient cooking environment. 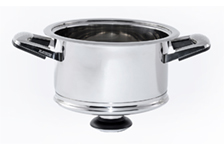 The Professional Platinum Cooking System offers more cooking, preparation, serving and storage combination(s) than any other cookware. All the individual units can be combined in any way you want. Pots, dishes, plates and ids can be creatively used together, similar to the concept of construction parts. Even a whole meal can be made at one burner. The result: energy saved and more space on the stove. 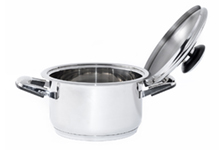 The special accuthermic compact base, with the force of 1.2 tons, gets inseparably adhered to the 1.2mm thick pot body made out of several light-metal layers. The bottom picks up even the lowest amount of energy extremely quickly, distributes it evenly over the entire surface and conserves it perfectly. 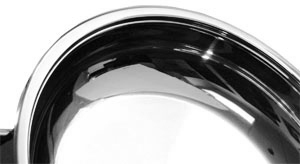 These attributes guarantee optimal heat conduction, distribution and conservation. 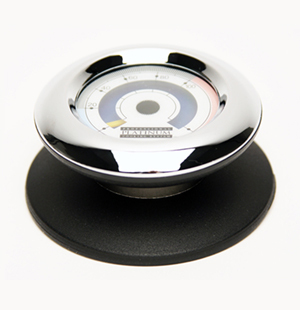 The Platinum TempAlert Knob lets you know, at a glance, if you are using the correct temperature. By looking at your Temperature Knob you will know whether to increase or decrease the temperature. 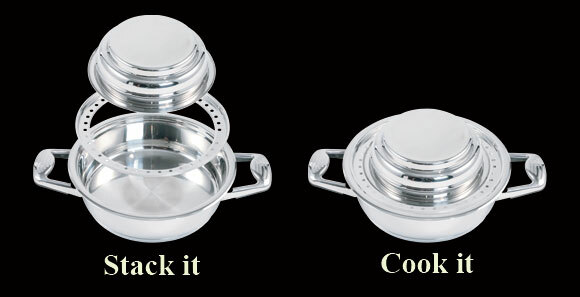 Enjoy reduced cooking time and eliminate pot-watching. 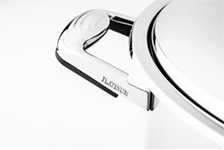 All Professional Platinum Cookware is manufactured using T-304 Stainless Steel to help insure even cooking, maximum durability, and save time with easy cleaning. T-304 does not oxidize or rust, which means your cookware will not only last a lifetime, it will also keep it's beauty and shine for a lifetime. All Covers function as Trivets. From the stove to the table.